So it has been a while since I wrote my last post. I have left the United States and arrived my home country, Taiwan, for about two months. But I know that I still have post about my last month of life in the states that I haven't finish writing them so I decided to finish them whenever I have time. I am just kinda busy working on my Taiwanese high school stuff like homework in the past two months, so I haven't have time to write. Alright, so let's get back to the topic. 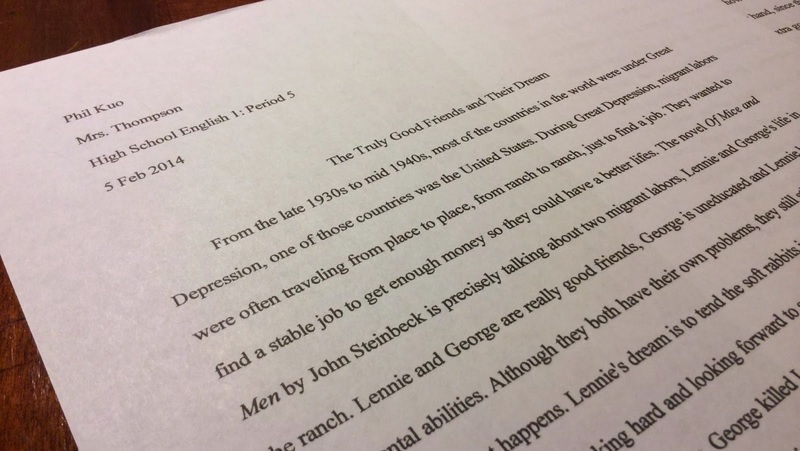 This post is about another essay project I have written when I was in Del Norte High. This is also the last essay I wrote before I got out from school and enjoy my summer break. Since this is not a small project, every one of the students of Ms. Thompson's English worked hard on this essay, and we even have to publish our finished essay publicly to a website called "My Hero" for every other students that have needs to read. So it's kind of a big deal for me. iPhone, the most popular phone in the world, was designed by one person. Along with iPod, iPad and iMac, this person has made Apple the most popular brand in the world. Jony Ive is the Senior Vice President of Design at Apple Inc. in California, where he works out of a top-secret studio somewhere near Cupertino. He designed many of Apple’s most successful products that are award-winning and popular that most of the people are using them today. Although he habitually avoids publicity and does not like to be interviewed, people are still trying to find out his personal history and story. Jony Ive was born in London and grew up in Chingford, a town that belongs to the Greater London metropolitan area. He has been obsessed with design since he was a kid; his father also do designs which is an important reason why Ive started playing with design at a young age. He was a star student at New Castle Polytechnic, the top design school in the England. Ive moved to San Francisco, California from London, England in 1992, when he was hired by Apple. In 1996, he became the Director of Design. Eventually, he reached an even higher level, Steve Jobs made him the Vice President of Industrial Design at Apple in 1998. Unbelievably, all the Apple’s most successful products are designed by Jony Ive and his small group. Without him, Apple would not be this successful. To be a successful designer, one must possess both outstanding creativity and good collaborative skills. Being a designer is not a simple job to do, without creativity, one might not have enough ideas to create new things. Without collaborative skills, one might not be able to work and communicate with others well. But Jony Ive possess creativity and collaborative spirit, therefore, he is a hero that inspires other designers all over the world. Everyone knows that one most important things a designer needs is to be creative. One's creative ideas can change the entire industry or even the whole world. For example, my hero, Jony Ive, has changed how people look at electronic devices. In 1998, Ive designed his very first product, the iMac, the computer which has a revolutionary design. The introduction of this product completely changed the desktop computer industry, because of its revolutionary new design that no designer had ever thought of before. “The simple truth is, Ive hates fuss and relishes simplicity. You can see that from his products. They may be revolutionary, high-tech magic boxes, but they look so elegantly simple that you know what they are for and how to use them the moment you first pick them up ”(Arlidge). Jony was interested in design since he was a kid, he decided to become a designer after he saw lots of minimal-designed sport cars while he was a teenager. After he was hired by Apple, he used his creativity to create lots of “surprises.” Jony thinks that many products are actually very poorly made, but people are using them because they have no choice, Jony decided to change this by using his creativity to “solve the problem.” He wants to make things simpler, he wants to make Apple’s products simpler, and easier to use. All of the products designed by him have one thing in common, that is, they all look simple but useful. Even if the products are newly introduced and people have never seen them before, they can still learn to use them very easily. Simple does that mean it is not well made. “He spent ‘months and months and months’ working out the exact shape of the stand of the desktop iMac computer because ‘it’s very hard to design something that you almost do not see because it just seems so obvious, natural and inevitable’”(Arlidge). Designing things is not a simple and easy job. Jony spent months just to make the new iMac computer so that it looks right. The reason why it is so hard and takes a designer so much time is that people are already used to the shape and how to use something they use every day. Jony wanted to change this. He thinks that people always limit what a thing can do, for example, he made music-enjoying and jogging possible to happen at the same time. The introduction of iPod take portable music-listening experience to a whole new level, people no longer need to carry a big CD player. If one can use their creativity spirit properly, they could change the world. There are so many ordinary things that we use every day but we never notice them, they could all be changed to be even simpler or easier to use! Jony is the person who has a creative spirit and has changed the modern world. Along with being creative, a hero like Jony Ive is often a team player. A great designer could inspire others, but can also be inspired by others easily. Every person could come up with an awesome idea that others never thought of before, everyone could figure out a way to make things better, but they need to be heard. The person who collects these brilliant ideas is the designer. A designer needs to know to listen and communicate with others, in order to accept other’s ideas and make their product better. Jony Ive is a person with very good collaboration skills; he can collaborate with others very well. He does not just design things, but he listens ideas and makes them even better. “There are times when I think either one of us or members of the team can feel discouraged. So I think that’s one of the things that’s fantastic working in groups. When you really think this can’t be solved and perhaps we’ve got too ambitious here, it’s fantastic when you’ve got other people around you to keep you going” (Grobart). Although there are only 15-20 people is his design group, it is still very hard to make all the people agrees to one idea. He thinks “successful collaboration” is not telling others agree to one’s idea, it’s combining everyone’s idea and comes with a even better idea. Also, he says that other people around you can keep you going, because they might not agree with your idea, but you can discuss with them and ask “how we can make it better”. With all the people in a design group rather than just one single designer, they can not only make things faster, but better. Working with others has another advantage, that is, everyone thinks differently. This does not seems to be a good thing, but it actually is. “When we were looking at objects, what our eyes physically saw and what we came to perceive were exactly the same. And we would ask the same questions, have the same curiosity about things.” (Allsopp) It is hard to make an ordinary object that everyone uses every day better, because people are all already used to it. To most people, an object might just be an object, nothing is special. But in the Apple design studio, a argument between designers might just have started. Every designer has their own thoughts about an upcoming product, but how they can figure out what to do? As a Senior Vice President of the Design Studio, Jony Ive uses his outstanding collaborate skill to lead everyone and find out a good way to solve the problem and even make it better. Jony says that collaboration is a requirement, because no one can do things perfectly all by themselves, they have to forget about their personal issues because they are working as a team. Because of Jony’s outstanding collaboration skills, he is able to make Apple better and take his design group to another level. Jony Ive is my hero because he possesses creativity and collaborative spirit, which are both very important for a person who is a designer. His creativity made most of his products become best-selling and eventually became revolutionary. With his excellent collaboration skills, he is able to work with others well. Jony Ive does not just design products. He uses his creativity to change the world. In the past 20 years, his iMac changed the desktop computer industry, his iPod changed portable audio devices industry, his iPhone changed the cell phone industry, and his iPad changed the definition of “computer”. I am truly inspired by Jony Ive and wanted to be a designer, because of all the great works he have designed. I am inspired to design beautiful concepts and now I know to work well with other designers, instead of working all by myself. When a person does so many things that made this world better and help people do things easier, I cannot disagree with giving him a title of “hero”.